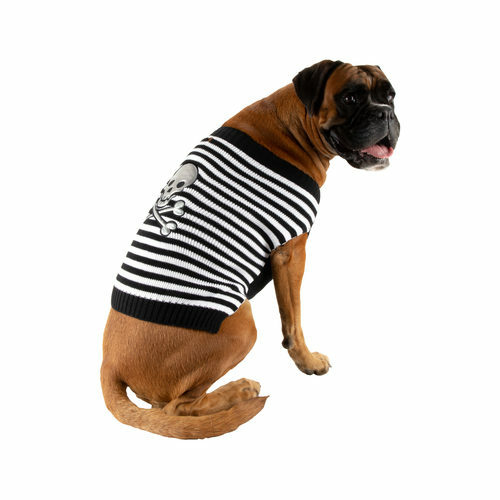 Good Boy Skull & Cross Bones Jumper is a fun outfit for your furry friend during Halloween. This jacket is made fro 100% acryl. With this outfit, you and your dog friend will spook out everybody during Halloween! Let your dog spook this Halloween with the Good Boy Skull & Cross Bones Jumpet outfit. This jacket makes sure your dog will have as much fun as you will have during the spooky days. With this fun jacket for your dog, you and your loyal friend can have a dress-up party. This will bring the real Halloween feeling to your home! This outfit is easy for your dog to fit in. Make sure to measure the length from collar to tail when measuring your dog for this Halloween outfit. This suit cannot be washed in the washing machine. What if the Good Boy Skull & Cross Bones Jumper doesn't fit? To check whether or not the Good Boy Skull & Cross Bones Jumper fits your pet, you can take the item out of the package and hold it up next to your cat. This will allow you to see whether or not it fits. For hygienic reasons, this item cannot be returned if it has been in direct contact with your pet. Should we conclude that the shirt is stained, has been worn, is covered in hair, smells bad or has been washed once the item is shipped back to us, it will not be returned to you. In this case, the item will be given to a local charity. Unfortunately, we have to apply these rules as we are often confronted with outfits that have been returned in a used condition. Have you used Good Boy Skull & Cross Bones Jumper before? Let us know what you think about this product.